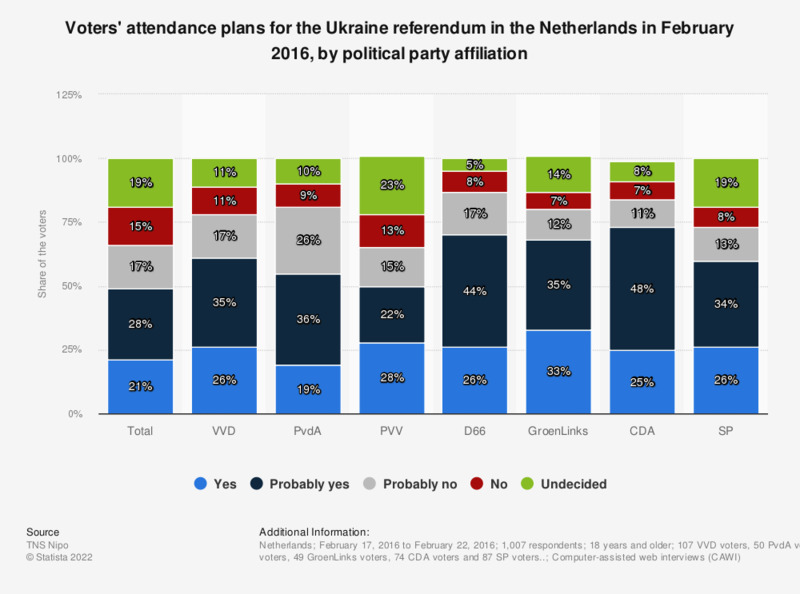 This statistic displays the results of a survey on the voters' attendance plans for the Ukraine referendum in the Netherlands in February 2016, by political party affiliation. Participants were asked whether they were going to vote in the Ukraine referendum in the Netherlands on April 6, 2016. During the survey period it was found that responding GroenLinks voters are most likely to participate: 33 percent of the respondents said they will definitely go voting. 107 VVD voters, 50 PvdA voters, 163 PVV voters, 73 D66 voters, 49 GroenLinks voters, 74 CDA voters and 87 SP voters.. The Ukraine referendum is about the question whether or not the EU should sign an association agreement with Ukraine. On April 6, 2016 all Dutch citizens 18 years and older are allowed to vote on this question in a popular referendum. A turnout of 30 percent is necessary for a valid referendum.